The previous article in this series looked at the number of Facebook and Twitter followers of New Zealand public libraries. The number of followers or likes provides a simple measure of a library’s social media success. But it doesn’t tell you how effectively you are engaging with them. There are several tools that can help you measure your level of influence, with Klout.com being the most popular at the moment. Christchurch City Libraries – by Aaron Tay’s ranking, Christchurch would rank well within the top 10 of all libraries, which is no easy accomplishment. Alison Wallbutton wrote an article earlier this year on Christchurch’s Twitter strategy which provides some really useful starting points for libraries to consider. Auckland Libraries – I think they’re still finding their feet after the transition into a super city and merging several Facebook and Twitter accounts into one will have affected their score. Klout also doesn’t appear to have recognised their Facebook presence so I’d be disappointed if their Klout score wasn’t above 50 before the end of the year. Wellington City Libraries – a strong Facebook presence with lots of engagement but it doesn’t seem to have been linked to their Klout.com profile. Expect a higher rating next time. 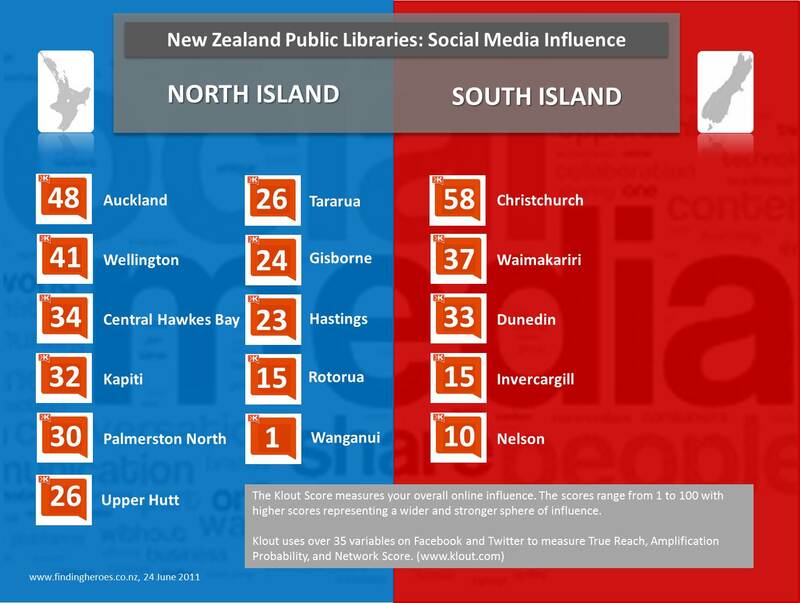 Waimakariri District Libraries – a surprise for the top 5 especially as they only have a Twitter presence. However their Twitter presence is unique. At least once a day they tweet the first lines from a book with a link to their catalogue – “follow our firstlines and let a book hook you“. Simple and obviously influential. Central Hawkes Bay Libraries – and just pipping Dunedin too. I found it very difficult to find their Facebook page which happens to be a profile rather than a business page (for the differences, click here). They were the only library to have a profile rather than a business page, and as such this may have influenced their Klout score. I did consider writing my next article on some best practice social media tips but decided there was enough food for thought here. If you would like to discuss how your library could improve its social media presence please do get in touch.